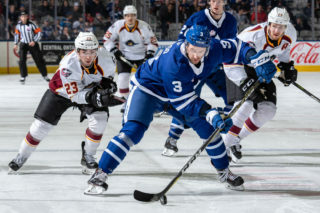 The Marlies were on the hunt for a win Friday night when they visited the Utica Comets for a North Division tilt. Four third period goals and a 37-save performance from Michael Hutchinson propelled the Marlies to a 5-2 road win over the Comets. Jeremy Bracco kept his point streak alive and opened the scoring halfway through the game at 9:14 of the second period. The goal, which was assisted by Calle Rosen and Dmytro Timashov, set a new Marlies single-season franchise record with 73 points in a 76-game season. The Marlies found a way to break things open in the third period with back-to-back goals from Colt Conrad and Michael Carcone. 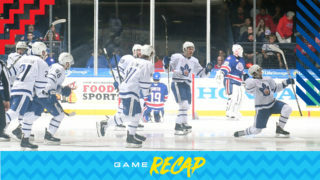 Conrad was making his debut with the Marlies and notched his first at 3:23, tipping in a point shot from Rasmus Sandin. Frank Corrado added the extra assist on the goal. 14 seconds later, Michael Carcone extended the Marlies’ lead to 3-0, firing home a shot from just outside the face-off circle. Pierre Engvall picked up the assist on that goal. Shortly after, the Comets solved Michael Hutchinson as Seamus Malone found the back of the net to get the home team on the board. Late in the frame, the Marlies found themselves down a man as Chris Mueller sat for two on a slashing call. The Comets opted for an additional extra man on the power play and sent Michael Leighton to the bench. Nicholas Baptiste was able to corral the puck and find the empty net to restore the Marlies’ three-goal lead. Less than a minute later, the Comets were able to capitalize on their power play to come within two with 23 seconds remaining. 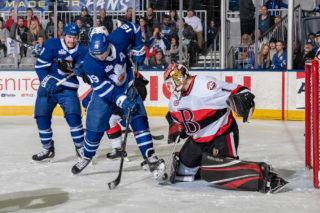 With 10 seconds to go, Dmytro Timashov shovelled the puck off the boards and it found its way to the empty net to seal a 5-2 victory for the Marlies. The Marlies will be back home tomorrow to host the Laval Rocket for a 7:00PM start at Coca-Cola Coliseum. Jeremy Bracco scored on the power play at 9:14 of the second period. Bracco has recorded a point (4-10-14) in nine consecutive games. He has 24 points (6 goals, 18 assists) in his last 22 games. 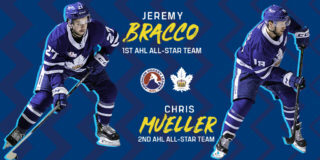 Bracco leads the AHL in points (73). Colt Conrad scored at 3:23 of the third period. This was his first AHL career goal in his first AHL career game. Michael Carcone scored at 3:37 of the third period. This was his fourth game-winning goal of the season. Carcone has 15 points (7 goals, 8 assists) in his last 17 games. Nicholas Baptiste scored an empty net goal unassisted at 18:58 of the third period. Baptiste has 27 points (14 goals, 13 assists) through 67 games this season. Dmytro Timashov scored Toronto’s second empty net goal at 19:49 of the third period and earlier had the secondary assist on Bracco’s second period goal. Timashov has 47 points (14 goals, 33 assists) through 66 games this season. Calle Rosen registered the primary assist on Bracco’s second period power play goal. Rosen has 45 points (7 goals, 38 assists) through 53 games. Rasmus Sandin recorded the primary assist on Conrad’s third period goal. Sandin has recorded 14 points (1 goal, 13 assists) in 10 games. Frank Corrado picked up the secondary assist on Conrad’s third period goal. Corrado has six points (2 goals, 4 assists) through 36 games this season. Pierre Engvall had the lone assist on Carcone’s third period goal. Engvall has 31 points (18 goals, 13 assists) through 65 games this season. Andreas Borgman recorded the primary assist on Timasov’s third period empty net goal. Borgman has 16 points (4 goals, 12 assists) through 40 games this season. Michael Hutchinson stopped 37 of 39 shots he faced and picked up the secondary assist on Timashov’s third period goal. Hutchinson’s record with Toronto is now 14-4-2-1 on the season with a .914 Save Percentage and a 2.59 Goals Against Average. Hutchinson is 7-1-0-0 when making 30-plus saves during a game. With his second period goal, Jeremy Bracco set the franchise record for points with 73 in a single season. The record was formerly held by TJ Brennan (2013-14). This is the sixth game this season where Toronto has scored four goals in one period. Toronto is 21-9-4-2 since January 4 and have outscored their opponents 118-103, facing 17 different teams. In 27 of 36 games, Toronto has earned a point (48). Toronto went 3-for-4 on the penalty kill and 1-for-7 on the power play. Utica had a 39-22 edge in shots in all situations. Adam Brooks led the Marlies with four shots on goal. The Marlies are 24-14-7-3 against North Division opponents and are 3-2-0-0 against the Comets. In each game this season, the team that has scored five or more goals has won with Toronto outscoring Utica 25-20. Toronto is 29-9-1-2 when scoring the first goal. The Marlies are 11-7-3-1 when tied after the first period and 26-1-2-1 when leading after the second period. Toronto is 17-12-3-2 when outshot by their opponent. The Marlies are 9-5-2-2 in Friday games and are 7-3-1-1 in March. Nicholas Baptiste has points (2-1-3) in three consecutive games. Jeremy Bracco has points (4-8-12) in eight consecutive games. Michael Carcone has points (1-1-2) in consecutive games. Pierre Engvall has points (2-1-3) in three consecutive games. Calle Rosen has assists (0-2-2) in consecutive games. Rasmus Sadin has assists (0-2-2) in consecutive games. Dmytro Timashov has points (2-1-3) in consecutive games. Tom Sestito (concussion) did not dress for tonight’s game. March 28: Returned defenceman Sam Jardine on loan to Newfoundland (ECHL). March 28: Returned forward Gabriel Gagne on loan to Newfoundland (ECHL). March 28: Returned forward Scott Pooley on loan to Newfoundland (ECHL). March 27: Signed forward Trey Bradley to ATO. March 22: Signed forward Colt Conrad to ATO. Certainly not a great display by us. We need to get points this time of the year here and luckily Hutchy was big for us when we had breakdowns and gave us a chance to hang around in the game a bit and found a way to break it open there in the third period fortunately for us. We’re going to take our two points, get on the bus and get out of here. 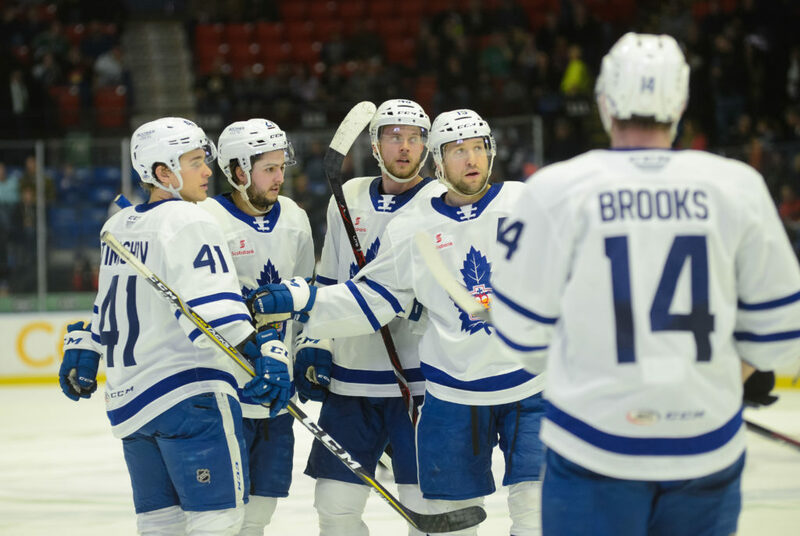 The Toronto Marlies will be looking to get back in the win column tonight when they take on the Utica Comets for a Friday night clash. 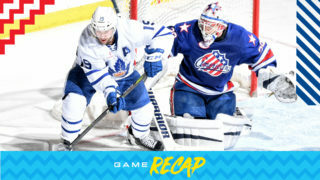 The Marlies suffered back-to-back losses to the Rochester Americans last weekend, falling to 35-22-7-4 on the season. Despite the losses, the Marlies have a firm hold on third place in the North Division with 81 points. The Comets will also be looking to bounce back tonight after dropping their last contest against the Syracuse Crunch. 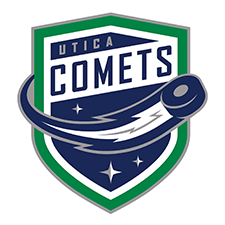 The Comets are currently out of playoff contention, but it’s not out of reach just yet as only six points separate them and the fourth place Belleville Senators. 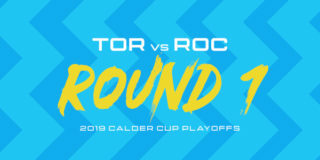 These two teams last met back in January when the Marlies evened up the season series 2-2 following a 6-3 win on home ice. After tonight they’ll meet once more this season. Players to watch: Jeremy Bracco sits first in league scoring with 72 points (19 goals, 53 assists) in 67 games. He has recorded a point (3-10-13) in eight consecutive games and has 23 points (five goals, 18 assists) in his last 21 games. Chris Mueller has points (10-9-19) in 12 consecutive games, currently the longest point-streak in the league.